When Jay and I started dating he had 3 great-grandmothers living. I thought that was really unique because mine had passed away when I was a little girl so to be a teenager and have that many living was just amazing to me. 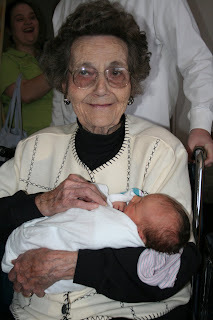 Last week, Jay's remaining great-grandmother, Mama Pearlie passed away. She was 91 and lived a great life. She was 20 years old when she married Jay's g-grandfather. She became pregnant soon after and lost the baby 6 months into the pregnancy. Her husband was so disappointed he wanted to try and have another child right away. He worked road construction and during the winter came down with pneumonia from working in the harsh conditions. He died just a few days later. Although she did not know it at the time, Mama Pearlie was 17 days pregnant with Jay's grandfather when her husband passed away. I cannot imagine living through that--especially during the depression. She was a single parent for 5 years until she re-married. Mama Pearlie was one of the most spiritual people I have ever met. Every time you were around her she was talking about God and spiritual things. Any time we'd visit we would always find her reading her Bible. When each of our children were born she gave them each a Bible with a special message in it. She always told us "Make sure they know the Lord--that's your job." She was a very wise women. During the last few months she has been in the nursing home and the kids loved going to visit her. Kynsley always wanted to make sure Mama Pearlie's feet were covered up so they wouldn't get cold and Bryson always liked helping Nana wash Mama Pearlie's gowns and take them back to her. The kids ended up staying with Nana last Tuesday and went to visit Mama Pearlie for over an hour. Although she hadn't known anyone that day, Melissa (Nana) said that she recognized them right away and said "Bring my babies over here for some kisses." I am so glad it ended up working out that they went up there that day. (They were originally going to stay with Angela but Anna Beth was sick). Mama Pearlie got very bad that night and passed away the next day. I really hope the kids will remember her. I know they're young but hopefully they'll be able to remember just a little of what a great women their great-great-grandmother was. That is one of the sweetest stories I have ever read. 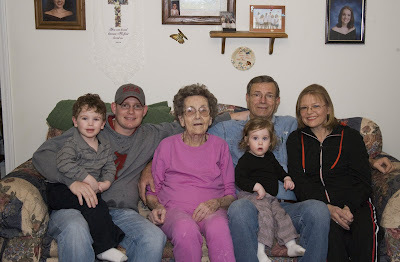 I think it is so great that they got to spend time with her before she passed. It sounds like she was a wonderful person! It really is amazing that B & K had an opportunity to know a Great-great-grandparent...not many people can say that. It was also sweet for you to pay this tribute to her. It sound like she will be greatly missed. What a great story. I am sure that she will be missed by all of you.